Upon arrival in Statia on April 14th, the DROP team boarded the R/V Chapman – a 127’ research vessel and mothership to the manned submersible Curasub (Substation Curacao). The goal of this trip was to explore deep reefs between 50 and 300 m and, for the first time, describe the communities that live at these depths off St. Eustatius. Reefs and other hard-bottom areas between 50 and 300 m are too deep for conventional scuba diving and are rarely surveyed by deep-diving submersibles or ROVS, making this diverse zone an area of the ocean that science has largely missed. Using the Curasub, the DROP team made five dives off the west coast of Statia, recorded more than 2000 visual observations of fishes and their depths of occurrence, and collected more than 350 samples of deep-reef fishes and invertebrates. Highlights from this trip are remarkable—at least eight species of fishes that are new to science and have yet to be formally described! These include two species of gobies (small, bottom-dwelling reef fishes) that are currently known only from Statia. A total of 38 species observed on our dives have never before been recorded from St. Eustatius—a number that is even more impressive considering that the most comprehensive review of the fishes of St. Eustatius was just published in 2016. This means that the plethora of new records from this trip is not simply due to scarcity of published data from St. Eustatius, but instead, highlights the importance of sampling from hard-to-reach habitats like deep reefs. In addition to finding new species or new records from St. Eustatius, the DROP team is also interested in finding out which deep-reef species are widely distributed and common in the Caribbean. For example, deep-reefs off Statia were home to large numbers of Pugnose Bass (Bullisichthys caribbaeus), Sabre Goby (Antilligobius nikkiae) and Bicolor Basslet [CB2] (Lipogramma klayi). These three species have also been recorded in large numbers from deep reefs off Curacao, Bonaire, Dominica, and Roatan Island. By collecting DNA samples of these species from each locality, DROP researchers can use cutting-edge population genetic analyses to begin to learn how deep reefs are connected across long distances, and ultimately understand whether distant localities can serve as a ‘refuge’ for local populations that experience declines due to habitat degradation or invasive lionfish. The DROP team also measured water temperatures along the deep-reef slope in an attempt to understand whether temperature is correlated with how deep fishes live on the reef slope. 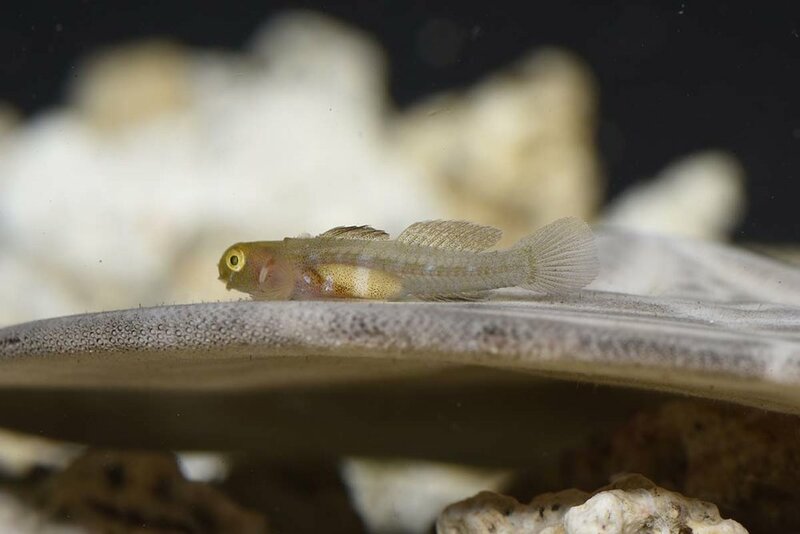 Preliminary data suggest that fishes living in the warm water off St. Eustatius occupied deeper depths than they did off the cooler waters of Curacao, Bonaire and Roatan. This may mean that fishes are indeed choosing their preferred depths based on temperature differences. The implications of this finding are paramount, as sea-surface temperatures are projected to rise in response to climate change, and fish may seek these poorly-studied deep-reef habitats in search of cooler temperatures in the future. Finally, a smaller DROP team remained on board to sample small to tiny fishes and invertebrates that inhabit sponges, more than 60 of which were brought to the surface by the Sirenas research team during five days of sub diving to depths of 50-250 m. Among the highlights of this collection were a weird shrimp, possibly a shell-less snail called a nudibranch, and one yellow organism with a soft exterior and hard interior that scientists couldn’t identify at all! We are grateful to the crew of Substation Curacao and the R/V Chapman for this amazing opportunity. Sub diving in choppy seas such as those encountered in Statia is challenging, and it requires talented and dedicated teams in the sub, on the surface boat, and on the ship. As owner of Substation Curacao and the R/V Chapman, Adrian “Dutch” Schrier, is fond of saying, “if this were easy, everybody would be doing it.” It is not easy. Thank you!